VeriCite DocumentationUser GuidesMoodle User Guide Admin ArticlesHow do I enable VeriCite in Moodle as an admin? From Site administration, go to Plugins > Plugins overview. Click the Check for available updates button. 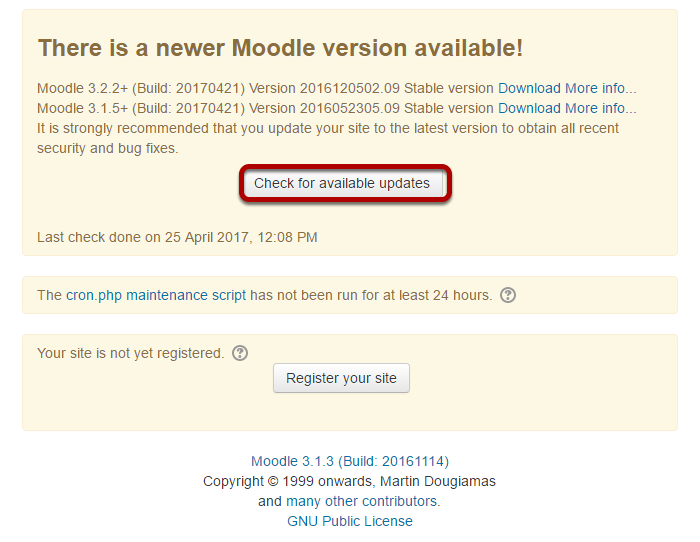 First, check for available updates to refresh the list of plug-ins available in Moodle. 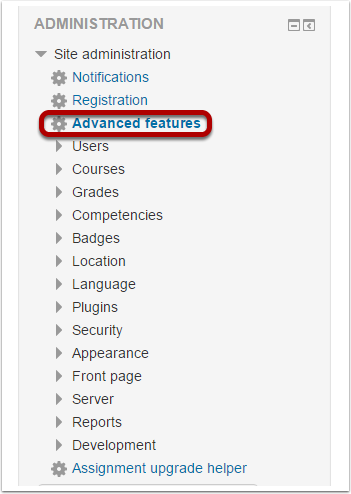 From Site administration, select Advanced Features. Check the box to Enable plagiarism plugins. Go to VeriCite in the Plugins menu. In the left navigation menu, expand the Plugins item. Then, under Plagiarism Prevention and select VeriCite. Check the box next to Enable VeriCite Plagiarism Service to enable the service. Advanced Settings: Check the boxes next to the following items to configure overall system settings. Disable dynamic inline submissions if you only want inline submissions to only be submitted once (modifications will not be re-submitted). Enable debugging for the module if you would like errors to be printed to the php error log. (Note: It is recommended that you only enable this setting for short periods. Show the preliminary score if you would like to view the preliminary (non-final) score. If disabled then a score will not be displayed until the external search is complete and the final score has been determined. Default settings for new assignments: Check the boxes next to the following items to configure the default settings for new assignments. Enable VeriCite Plagiarism Service - New assignments will have VeriCite enabled by default. Allow students to view scores - Students are able to view their own VeriCite report scores. Allow students to view reports - Students are able to view their own VeriCite reports. Exclude Quotes - Quoted text is automatically excluded from the VeriCite report. To lower the number of false positives, we recommend setting quotes to be excluded as the default. Instructors will be able to toggle between excluding and including quotes within individual reports. Hide setting for "Exclude Quotes" from instructor - The option to modify the Exclude Quotes assignment setting will not be available for instructors. Exclude Self Plagiarism - Exclude matches for the same student submitting the same paper in the same course. Multiple submissions will be treated as drafts. Hide setting for "Exclude Self Plagiarism" from instructor - The option to modify the Exclude Self Plagiarism assignment setting will not be available for instructors. Store in Institutional index - Store assignment submissions in the private repository for the institution. These submissions will be indexed for comparison with all other papers submitted to the same institution. Hide setting for "Store in Institutional index" from instructor - The option to modify the Store in Institutional index assignment setting will not be available for instructors. Default settings for new forums: Check the boxes next to the following items to configure the default settings for new forums. Allow students to see scores if you want that option to be selected by default for new forums. Allow students to see reports if you want that option to be selected by default for new forums. Exclude Quotes if you want that option to be the default for new forums. To lower the number of false positives, we recommend setting quotes to be excluded as the default. Instructors will be able to toggle between excluding and including quotes within individual reports. Click Save Changes once you have entered all of the information above. Next: How do I access VeriCite administrative features?